Iran’s atomic energy chief said on Tuesday that the regime has the capability to enrich uranium up to 20 per cent within four days. 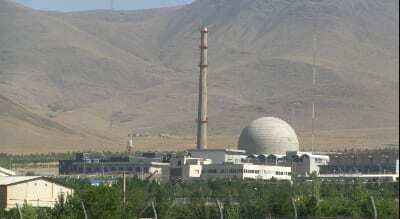 The Iranian nuclear program’s heavy water reactor at Arak. Credit: Nanking2012 via Wikimedia Commons. The 2015 Iran nuclear deal limits the level to which “it is allowed to enrich uranium to 3.67 per cent purity, well below the 20 per cent it was reaching before the deal, and the roughly 90 per cent suitable for a nuclear weapon,” reported Reuters. This development comes as Iran launched a satellite-carrying rocket into space, also on Tuesday, amid fears from Israel and the United States.